This is my painterly reaction to the catastrophic event that changed our relationships in the world. The analogy made here is to the Shoah [the Holocaust] -- then [too] lives were forever changed in an instant. The painting’s right has 9/11 images that are almost life-size figures; they are recent. These were inspired by photos in the NY Times. Small, less distinct figures of darker hue fill the left -- history. The players serve the striving metaphor. While we cope with the past and the present, we strive to continue our creative lives. For a long time I have been intrigued by basketball players. Their reaching for the net with the ball is a powerful metaphor of life’s goals and the struggle to achieve them. I saw the 9/11 tragedy as a continuation of man’s inhumanity which had its first (and, I would pray, its last) climax in the Shoah. As the Shoah figures developed, the atmosphere of the painting became depressing, and I turned to basketball for some measure of optimism. At first, the ball was realistic -- then gold leaf was applied. Finally, with just a hint of gold in the ball it became more abstract and served to highlight the striving metaphor. This painting was part of the "Unity Of Being" exhibition in March ‘03 at Bentley College, Waltham, which also featured the work of Sherry Autor and Judith Jaffe. The painting was also at University Place, Cambridge, with the Cambridge Art Association. Other paintings shown at Bentley include Lamed-Vov, Reflections -- 20th C., Sinai, and Dust Of Stars. 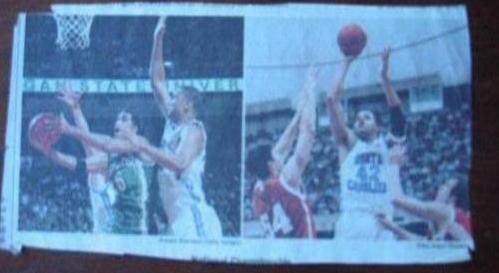 "Photos: North Carolina forward Sean May had a shot blocked by Stanford forward Matt Haryasz. May had 12 points and 7 rebounds last night. (Richard Perry/The New York Times)(pg. D4); North Carolina forward Rashad McCants scored a team-high 18 points. (Associated Press) (pg. D1)"
Sean May, North Carolina player #42, clearly informs the main basketball player of Golahny's painting, while Matt Haryasz of Stanford (usually #52, oddly here #54) and Rashad McCants of North Carolina both inform the stretching arm of the other player. Significantly, Golahny altered May's #42 to a #9. The falling towers, upright amidst toppling, may be read as "11"."